To book tickets now please enter the access code here. The updated schedule for Sunday, 12th March can be found by clicking here (PDF). For a full schedule and further updates, please visit the Horse of the Year website at www.hoy.kiwi or call iTICKET Customer Support on 0508 484 253. Tens of thousands of people can't be wrong. The Horse of the Year Show is touted as one of the greatest equestrian celebrations on the planet by people all over the world. It's a true celebration of all things equestrian that encompass all that is good about New Zealand and a shared love of horses. Come and be part of one of the biggest sporting events in the Southern Hemisphere – you won't regret it for a minute! Any day parking ticket for parking in the Polo Grounds only. Entrance to the Polo Grounds off of Bennet Road. A parking ticket is required each day. There are a range of VIP events for everyone to enjoy at HOY. You can enjoy cocktails at our Hall of Fame event whilst you watch our next HOY superstar get inducted, or you can sit back with a glass of champagne whilst you watch the thrilling Cross Country over breakfast. To top it all off you can end HOY on a high with our Official After Party! Harney & Sons Dessert Degustation with Adriano Zumbo presented by Orton Tailored Cuisine - Saturday 11th March 4:30pm - 6:00pm - Recently updated! Join us for an afternoon of indulgent desserts and new york style tea with internationally acclaimed dessert chef Adriano Zumbo. The celebrated patissier and star of Zumbo’s Just Desserts, has designed a 5 course dessert degustation menu showcasing his unique flavour combinations, exciting textures and signature bold colours which will be created by Orton Tailored Cuisine and accompanied by Harney and Sons Fine Teas and champagne. $79 per person (does not include GA entry to the show) or $105 per person for both GA ticket to showgrounds and Harney & Sons Dessert Degustation ticket. 5 course canape dessert degustation created by Adriano Zumbo and prepared by Orton Tailored Cuisine. Friday Night Extravaganza “Fish n Chips” Package - Friday 10th March From 5:00pm - Sold Out! Get the full Friday Night experience with ‘Fish & Chips’ and a complimentary beverage in the VIP lounge as you catch all the action in the Hastings, heart of Hawke’s Bay Friday Night Extravaganza. The perfect way to spend a Friday Night. Lounge opens from 5pm. Fish & Chips from Orton Tailored Cuisine. Full bar available until 9pm. Elegant set breakfast menu from Orton Tailored Cuisine. Cape Kidnappers Hall of Fame Cocktail Party - Thursday 9th March 2016 5:30pm - 8:30pm - Sold Out! Celebrate your time at Horse of the Year by unwinding at the Riders After Party. This R 18 event will have you dancing till midnight as you celebrate HOY 2017 drawing to a close. ​HOY Lunch - Tuesday 7th to Sunday 12th March between 12:30pm - 2:00pm each day - Sold Out! Enjoy the finest food from Ortons Tailored Cusine whilst you watch the competition unfold around you in HOY's VIP Tent. The double sided venue allows you to watch both the Land Rover Premier arena as well as the Altech and Show Jumping Arena 3. HOY Weekend Package - limited available - Sold Out! Show Public Camping: - Sold Out! Horse of the Year Show Public Camping is available to all spectators. 3 Day and 6 Day Camping passes are available, which includes access to the Horse of the Year show and 1 non powered camp site. Public campers are able to access the camping facilities amd amenities on site, but be quick spaces are limited. Public Camping is available in three zones only - Red, Blue and Green. Camp sites are not allocated at time of booking, but upon arrival at the Horse of the Year show. Your camping pass entitles you to access to the Hawke's Bay A & P Showgrounds and Horse of the Year Show and 1 Non powered campsite in your selected zone. Your ticket will be validated upon entry into the Hawke's Bay A & P Showgrounds and to the Horse of the Year Show. Public campers are only entitled to camp and have access to the Hawke's Bay A & P Showgrounds for the duration of their ticket. If they intend to stay longer they will need to purchase additional tickets. Public camping is only available in the Red, Blue and Green zones. No Public camping is available in the Purple Zone due to Health & safety reasons. 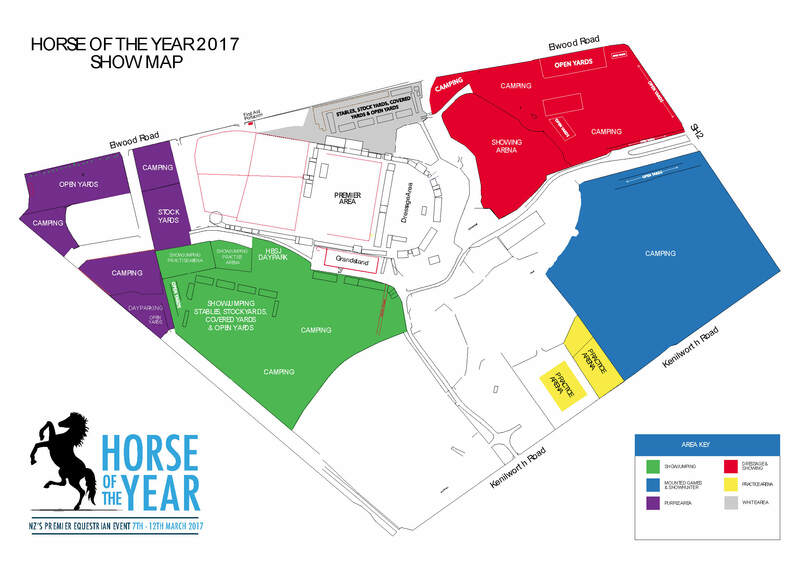 If the zone you have selected is at capacity, upon your arrival at the Showgrounds, you will be allocated another area by Horse of the Year management. Camping passes must be displayed either on the vehicle dashboard or attached to the tent. All Public campsites are Non powered. Camping Sites are allocated on a first come first served basis. Public Camping tickets are limited to 100 tickets. Proof of purchase / iTICKET receipt does not entitle you to entry to the camping area or the Horse of the Year Show. An official Horse of the Year wristband and parking pass is required. Wristbands and parking passes will be sent out in early February 2017 to the postal address provided. Note that your Any Day tickets include the Friday Night Extravaganza if your ticket is used on the Friday for entry.